'Double Feathers' ~ is a beautifully handcrafted ceramic pendant bead. 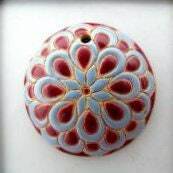 Round domed shaped terracotta pendant, 39mm diameter. Hand carved and hand painted, glazed on both sides.